Home » Game Reviews » Muertoons: Can You Outwit Tio Rico and Reach the Celebration First? Written by: KristaG on October 31, 2018. Today is not only Halloween but also the beginning of the multi-day holiday of Dia de los Muertos or “Day of the Dead.” It is believed in many cultures that during this time, the veil between the worlds of the living and the dead is lifted/thinner, which allows for interactions between the two. In honor of these celebrations, my friends and I are playing Muertoons from Steve Jackson Games, which is a light and quick 3-5 player card game where players are competing to be the first to reach the Dia de los Muertos festival in Muertown. The first of the Muertoons children’s books, Rosita y Conchita! 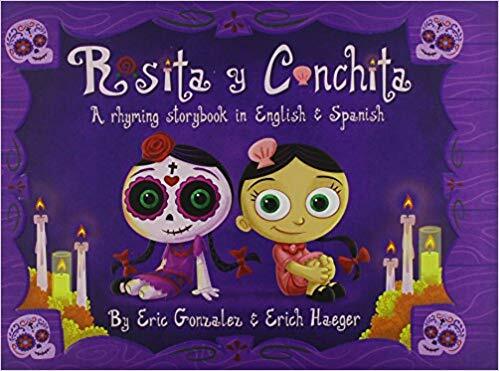 The franchise was originally envisioned to begin as a graphic novel back in 2008 but instead started out with Rosita y Conchita, a bilingual rhyming children’s book about two sisters. In 2010, creators Eric Gonzalez and Erich Haeger launched their own production company followed by another children’s book and a television show. The cartoon, which is produced by Wilmer Valderrama, came out in 2015 and centers on a group of friends (Rosita, Lupita, Bibi, Gaby, and Rubi) who live in a world where every day is Dia de los Muertos in a town called Muertown. 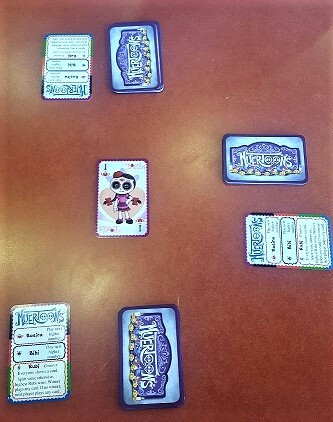 Eventually, in 2017, a card game was released through Steve Jackson Games using the Muertoons IP. The game is based on another Steve Jackson Games title called Spooks, which was designed by Jason D. Wittman and released in 2003. The Muertoons rules were developed by Devin Lewis and Samuel Mitschke. As with everything in the franchise, the artwork is very stylized, cute, colorful, and pays homage to the Mexican holiday. An example 3-player set up. Before starting the game, each player should receive a reference card and the Rosita “1” card should be placed in the middle of the play area. All remaining cards are shuffled and dealt out to each player plus an extra hand for the wily Tio Rico. Without looking at Tio Rico’s hand, it is placed back into the box as they will not be used for the game (these symbolize the “signs” that he has removed from the path to try and sabotage the festivities). The player to the left of the dealer is nominated as the first player and the game is able to begin once all players pick up their hands. 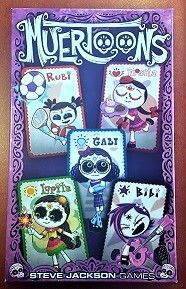 As with the show, there are 5 characters in the game: Rosita, Rubi, Gaby, Bibi, and Lupita. Each character comes with their own set of rules, which informs the players what type of card is allowed to be played next to the discard pile. For example, the game always starts with the Rosita “1” card. 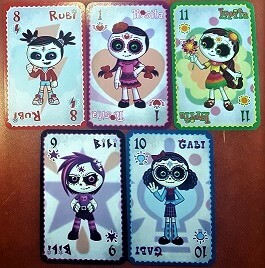 Rosita’s character allows players to play any card of the next higher number (in this case any character card that has a “2” on it). All character rules are listed on the reference cards as well as in the included rules. Should a player not be able to play a card on their turn, they are allowed to pass unless a special rule prevents them from doing so. The first player to run out of cards has victoriously been the first to reach the festival and wins the game. I had the honor of meeting the Muertoons creators while at SDCC this summer and, though I had already been planning on reviewing the game for Halloween, I found myself falling in love with the franchise all over again. The artwork draws me in every time. My favorite of the Muertoons is probably Bibi, and I was thrilled to see all of the Muertoons merchandise and art prints at their booth. The game itself is quick and great for families with kids. It’s portable and takes very little space to play in, which makes it a great addition for my collection as we are almost always on the go and I can just tuck it into my bag before we walk out the door. I love that each character comes with her own rules that will drastically change the gameplay from one turn to the next. Anybody looking for a game set in the atmosphere of the season would do well to pick up a copy of Muertoons for some holiday-themed fun!